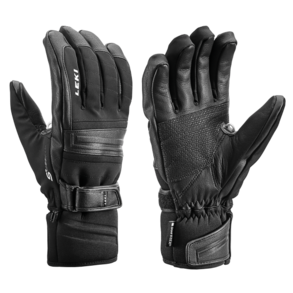 The Leki Prospect S provides a high-performance ski glove with Primaloft insulation( giving greater warmth than standard insulation) for particularly cold days. The SOFT-TEX® membrane and the softshell on the outer hand offer optimum climatic comfort. The wet and wind are kept out and your hands are kept warm, as the Prospect S lets out the damp. Premium goatskin on the inside hand ensures a secure grip. Reinforced fingers, a comfortable design, and long, smooth cuffs provide optimum grip and good handling with the pole. The Trigger S system lets you click onto and from the pole quickly and easily. In addition, it reduces the risk of injury by releasing the glove from the grip when pulled upwards during a fall.